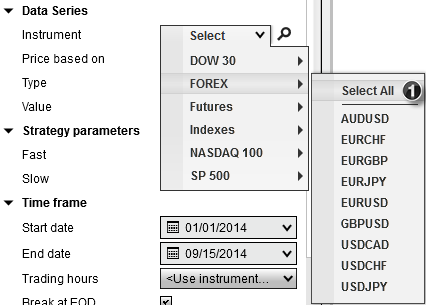 You can Backtest, Optimize or Walk Forward optimize a basket of instruments by selecting an instrument list using the instrument selector in the settings panel. Once the test is complete, a listing of all the results will be displayed. Selecting an individual row from the results grid will display the results in the Performance tabs individual performance results. When reviewing the following combined results, some values will be the total summation across all instruments, while others will be weighted to the total number number of trades. For all other statistics, the combined results will be a weighted average (exception here is the RSquared statistic).